The news that a message has been sent using a beam of neutrinos awakened a flood of memories. Back in the late 1970s I was involved with the Society for Amateur Radio Astronomers, mostly as an interested onlooker rather than as an active equipment builder. Through SARA’s journal I learned about Cosmic Search, a magazine that ran from 1979 through 1982 specializing in SETI and related issues. I acquired the entire set, and went through all 13 issues again and again. I was writing sporadically about SETI then for Glenn Hauser’s Review of International Broadcasting and later, for the SARA journal itself. Cosmic Search is a wonderful SETI resource despite its age, and the recent neutrino news out of Fermilab took me right back to a piece in its third issue by Jay Pasachoff and Marc Kutner on the question of using neutrinos for interstellar communications. Neutrinos are hard to manipulate because they hardly ever interact with other matter. On the average, neutrinos can penetrate four light years of lead before being stopped, which means that detecting them means snaring a tiny fraction out of a vast number of incoming neutrinos. Pasachoff and Kutner noted that this was how Frederick Reines and Clyde Cowan, Jr. detected antineutrinos in 1956, using a stream of particles emerging from the Savannah River reactor. In his work at Brookhaven National Laboratory, Raymond Davis, Jr. was using a 400,000 liter tank of perchloroethylene to detect solar neutrinos, and that’s an interesting story in itself. The tank had to be shielded from other particles that could cause reactions, and thus it was buried underground in a gold mine in South Dakota, where Davis was getting a neutrino interaction about once every six days out of the trillions of neutrinos passing through the tank. We’ve had a number of other neutrino detectors since, from the Sudbury Neutrino Observatory in Ontario to the Super Kamiokande experiments near the city of Hida, Japan and MINERvA (Main Injector Experiment for ν-A), the detector used in the Fermilab communications experiment. The point is, these are major installations. Sudbury, for example, involves 1000 tonnes of heavy water contained in an acrylic vessel some 6 meters in radius, the detector being surrounded by normal water and some 9600 photomultiplier tubes mounted on the apparatus’ geodesic sphere. Super Kamiokande is 1000 meters underground in a mine, involving a cylindrical stainless steel tank 41 meters tall and almost 40 meters in diameter, containing 50,000 tons of water. You get the idea: Neutrino detectors are serious business requiring many tons of matter, and even with the advantages of these huge installations, our detection methods are still relatively insensitive. Image: Scientists used Fermilab’s MINERvA neutrino detector to decode a message in a neutrino beam. Credit: Fermilab. But Pasachoff and Kutner had an eye on neutrino possibilities for SETI detection. The idea has a certain resonance as we consider that even now, our terrestrial civilization is growing darker in many frequency bands as we resort to cable television and other non-broadcast technologies. If we had a lively century in radio and television broadcast terms just behind us, it’s worth considering that 100 years is a vanishingly short window when weighed against the development of a technological civilization. Thus the growing interest in optical SETI and other ways of detecting signs of an advanced civilization, one that may be going about its business but not necessarily building beacons at obvious wavelengths for us to investigate. Much discussion of SETI has been taken up with finding a suitable frequency for radio communication. Interesting arguments have been advanced for 21 centimeters, the water hole, and other wavelengths. It is hard to reason satisfactorily on this subject; only the detection of a signal will tell us whether or not we are right. Neutrino detection schemes, on the other hand, are broad band, that is, the apparatus is sensitive to neutrinos of a wide energy range. The fact that neutrinos pass through the earth would also be an advantage, because detectors would be omnidirectional. Thus, the whole sky can be covered by a single detector. It is perhaps reasonable to search for messages from extraterrestrial civilizations by looking for the neutrinos they are transmitting, and then switch to electromagnetic means for further conversations. Making this possible will be advances in our ability to detect neutrinos, and it’s clear how tricky this will be. The recent neutrino message at Fermilab, created by researchers from North Carolina State University and the University of Rochester, is a case in point. Fermilab’s NuMI beam (Neutrinos at the Main Injector) fired pulses at MINERvA, a 170-ton detector in a cavern some 100 meters underground. The team had encoded the word ‘neutrino’ into binary form, with the presence of a pulse standing for a ‘1’ and the absence of a pulse standing for a ‘0’. 3454 repeats of the 25-pulse message over a span of 142 minutes delivered the information, corresponding to a transmission rate of 0.1 bits per second with an error rate of 1 percent. Out of trillions of neutrinos, an average of just 0.81 neutrinos were detected for each pulse, but that was enough to deliver the message. Thus Fermilab’s NuMI neutrino beam and the MINERvA detector have demonstrated digital communications using neutrinos, pushing the signal through several hundred meters of rock. It’s also clear that neutrino communications are in their infancy. 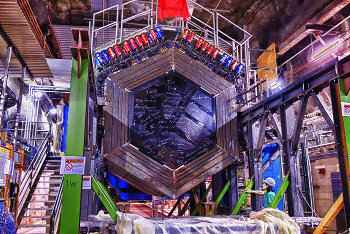 …long-distance communication using neutrinos will favor detectors optimized for identifying interactions in a larger mass of target material than is visible to MINERvA and beams that are more intense and with higher energy neutrinos than NuMI because the beam becomes narrower and the neutrino interaction rate increases with neutrino energy. Of particular interest are the largest detectors, e.g., IceCube, that uses the Antarctic icepack to detect events, along with muon storage rings to produce directed neutrino beams. We are such novices in communication, with even radio communications not much different from 100 years old, as we learned from the Titanic’s difficulties with wireless in 1912. Now that we have taken baby steps with neutrino communication, and checked neutrino oscillations between distant sites on Earth, it is time to think eons into the future when we can imagine that the advantages of narrow-beam neutrinos overwhelm the disadvantages of generating them. As Yogi Berra, Yankee catcher of my youth, is supposed to have said, “Prediction is hard, especially about the future.” Still, neutrino beams may already be established in interstellar conversations. I once examined Raymond Davis’s solar-neutrino records to see if a signal was embedded; though I didn’t find one, who knows when our Earth may pass through some random neutrino message being beamed from one star to another–or from a star to an interstellar spaceship. Neutrino communications, as Pasachoff and Kutner remarked in their Cosmic Search article, have lagged radio communications by about 100 years, and we can look forward to improvements in neutrino methods considering near-term advantages like communicating with submerged submarines, a tricky task with current technologies. From a SETI perspective, reception of a strong modulated neutrino signal would flag an advanced civilization. The prospect the authors suggest, of an initial neutrino detection followed by a dialogue developed through electromagnetic signals, is one that continues to resonate. Paul thanks again for an excellent article! I think that for at least the transmission part, laser wake accelerators will be a good start for miniaturizing the transmitter. I just don’t see how one could reduce the mass of the detector though. It’s less an engineering problem than a physics problem. Eric, I do have a copy of His Master’s Voice but have never gotten around to reading it. Will have to remedy that soon! The energy required to transmit the information must have been huge, with tougue in cheek would it have not been better to tap the rock to send the information. Paul, I recommend to you and everyone else to read Lem’s classic novel His Master’s Voice. It is almost like reading a philosophical treaty on many subjects. And I am happy to say – and anyone who has even a general familiarity with Stanislaw Lem will know – that the story does not end with a wise old alien telling a human child to “Be Good” or for the human race to get its act together or else. Communicating via neutrinos would virtually assure that those advanced enough to use such methods for talking across the galaxy would not get lower or “wrong” species on the line, as it were. Think of it as kind of a passive Prime Directive. Besides, most neutrino astronomers on this planet probably would not recognize an artificial neutrino signal, or at least not admit it to their bosses or publicly. Is their some exotic matter that could act as a detector upon which we could speculate. Could something like high density positronium do the trick? If you do a search on “Neutrino Optics”, you will find that there have been some theories that neutrinos will reflect at very grazing angles much like x-rays do. If this is correct, then one might be able to make neutrino lenses to concentrate a beam of them for detection and make the detector highly directional. If I remember correctly, the available grazing angles are hundredths of a degree making such optics “difficult” but not impossible. Of course, nuclear reactors produce copious quantities of neutrinos and anybody who made such optics would be able to easily locate nuclear submarines underwater. Just thinking about thinking about working on this makes me paranoid for this reason. You might just have a fatal “accident”. I concur that “His Master’s Voice” is superb SciFi and well worth reading. I have a web site at http://myweb.tiscali.co.uk/bobandrews/ that may be of interest to you. Also at http://www.janus.kirion.net/ you will find an Abstract of a Faster-than-light communication concept. Janus is under reconstruction and will be developed to Foundation status later this year. I believe that FTL communication systems will have to be developed before FTL propulsion and I and my associates have been concentrating on these projects for over 30years. My best regards. Bob Andrews. I’m not a quantum physicist, but neutrinos interact with matter via the Weak force, so I think your exotic matter would have to have some neutrons as well as electrons/positrons. Yes David, Iwas just thinking leptons when I think I should be thinking weak. Abstract: We discuss the possibility to use a high energy neutrino beam from a muon storage ring to provide one way communication with a submerged submarine. Neutrino interactions produce muons which can be detected either, directly when they pass through the submarine or by their emission of Cerenkov light in sea water, which, in turn, can be exploited with sensitive photo detectors. Due to the very high neutrino flux from a muon storage ring, it is sufficient to mount either detection system directly onto the hull of the submersible. The achievable data transfer rates compare favorable with existing technologies and do allow for a communication at the usual speed and depth of submarines. Maybe no optics are necessary. A network of three or more conventional detectors should enable the triangulation of any Earth-local detectable source of neutrinos quite readily. Anyone know if there are mysterious blackout periods in the schedules of existing detection facilities? @Eniac there actually HAS been a paper suggesting your idea on triangulating the positions of submerged nuclear subs using an array of neutrino detectors! @coolstar: Thanks, that is pretty cool, indeed! @Eniac I showed that paper to a friend who used to work at the Nevada Test Site as a nuclear chemist (and thus got classified briefings on various subjects) and he thinks the DoD may have actually built said ginormous (Ice-Cube sized detectors)…….The funding involved wouldn’t actually be prohibitive to hide among Black Projects. As Tom Clancy said in his novel The Hunt for Red October, what the military has now the public will get to see about twenty years later. This was during the Cold War when he said it, so things may have changed a bit. Think about the enormous trove of astronomical data that the military might be sitting on to be released in 20 years, if ever…. But since the universe is mostly empty space, photons are better in most cases for communications, and just as fast. So I don’t know why an interstellar civilization would use neutrinos for space communications? What am I missing? Recently US plans for the LBNE next-generation neutrino experiment have run into trouble finding room in projected HEP budgets. Today (via Emanuel Derman’s twitter feed), I learn of a promising new source of funding. A Forbes columnist reports here on prospects for using neutrino-based communication through Earth to do high-frequency trading, arbitraging prices in markets on opposite sides of the globe. To actually do this, I’d guess that financial firms would have to site machines like Fermilab’s proposed Project X and detectors like the LBNE one close to the servers running the markets. When they do this, maybe they’ll let physicists use them on weekends to do physics. It has been unclear whether the US government could afford to build Project X/LBNE, but surely Goldman Sachs and other major investment firms would have no problem coming up with the billions needed. Yes, I’m well aware that this is a completely insane and ridiculous idea, but that hasn’t been an obstruction to Wall Street innovations in recent years. Update: For the latest on LBNE, see this from Nature, out today. For the impatient, however, the latencies of the long-haul international fiber connections are something of an issue. The index of refraction in glass is n~1.5, and the cable routes don’t adhere to the great circles. Using NTT’s Looking Glass service, one can run traceroute between far-flung nodes on the Internet. For example, right now, round-trip travel times between London and Tokyo are taking about 265 milliseconds, with routing that runs on the Atlantic and Pacific Ocean bottoms and (effectively) along Route 66. Previous post: How Will Humans Fly to the Stars?